"I have used the full line of Taos Twist in my restaurant for over 10 years. As an intimate Bistro, ambience is very important to me. 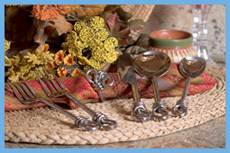 The unique charm of your silverware helps me create a warm atmosphere. My customers always comment on the substantial weight and heavy feel often asking where they can buy it. My staff and I are impressed with its durability. It takes a beating in our commercial dishwasher but always comes out looking great. THANK YOU TAOS TWIST." 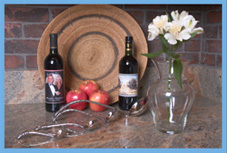 "We enjoy entertaining and our silverware is always a conversation piece. It's great to have something so unique. We love it. Thanks." " When I first saw Taos Twist, I was so impressed with the quality, style and balance of the product that I just had to buy some. 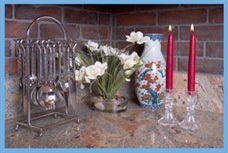 I also purchased Taos Twist table settings and accessories as gifts for my daughter and niece. Both were completely thrilled with the product and have told me of the many complements they received on the table settings. My daughter loves the uniqueness of the set. "No one has ever seen anything like these before and I love that about them." My niece said the same thing almost verbatim! "Aunt Carolyn, this set is so different from anything I have ever seen, I love them, and my friends are so impressed. Thank you for having such good taste!" "
"I love this flatware. They are gorgeous and I use the stand to display them so they are seen by guests. What I really like the most is the weight of these utensils. They are weighted correctly to hold in your hands and give the assurance that you are holding something substantial, not cheap. Wonderful flatware that I can just throw right in the dishwasher. " "We love the "Twist" down here in Texas. Great to be able to accessorize my table with everything from one pattern. 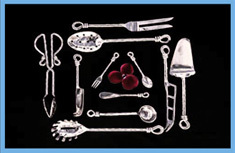 Especially love the iced tea spoons and the big ladle for my punch and chili." "My wife and I spent months looking for something we could agree on for our new silverware. As soon as we saw Taos Twist we knew it was for us. Love its uniqueness. Thanks!" 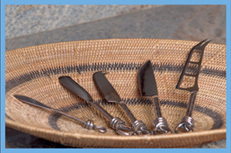 " My wife and I have had our Taos Twist flatware for several years now. We are always proud to use the service and always get compliments from our family and friends. It is truly unique and we love the fact that each and every piece is handmade. "